Do you own a pair of rain boots? If yes, do you like to wear them? Che carini questi, mi ricordano quelli che mamma portava negli anni 80 e che profumavano pure! What a lovely perspective on dealing with the rain Lilli! and how darling are your rain boots! The heart and cloud detail are so fun and whimsical and I love how you added your own floral touch. I have a pair of slim black Hunter rain boots. Not as fun as yours but they are sleek and get the job done :) Happy new week lovely! 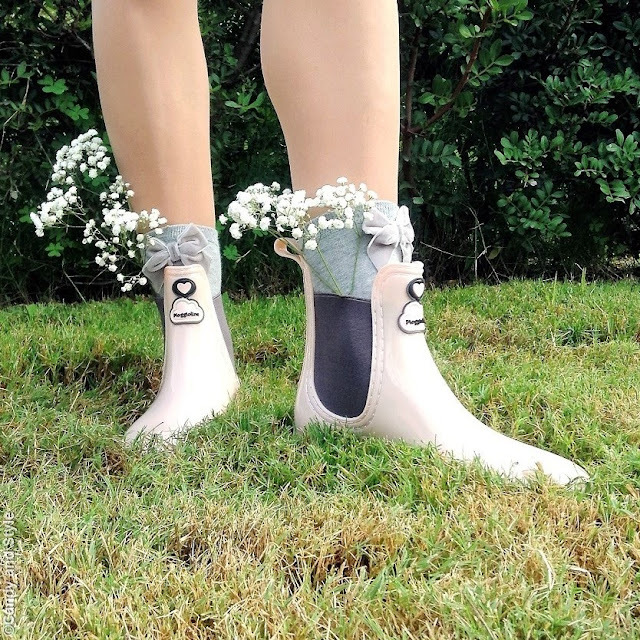 Your rain boots are the cutest. Makes you want to sing in the rain. Hi Lilli! When the rains come in winter I have sometimes wanted to buy a pair because the mud ruins the shoes, these are very cute and original design, kisses! Sei unica Lilli, sono un amore! I don't have any rain boots, which is a bit off seeing as it rains all the time in the UK!